Dutcher are wonderful people and great community allies. But this one was to be a little different. The couple had chosen today specifically because it was Pi Day. 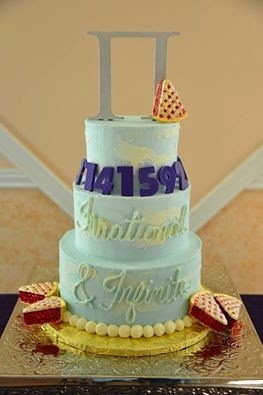 Pi Day is celebrated every March 14 to lift up the mathematical symbol. Pi is used to represent a constant — the ratio of the circumference of a circle to its diameter — which is approximately 3.14159. But that’s just the starting point. It has been calculated to over one trillion digits beyond its decimal point. Today’s date, beyond the normal celebration of 3.14 is even more special; it’s the centennial Pi date that won’t happen again for another hundred years. Today, you can live in the pi moment up to 3.141592653 if you are paying attention. It’s too late for this morning but here in Colorado, there is still an opportunity to pause and savor the once a century moment of 3/14/15 9:26:53 PM. Even those who are mathematically challenged (i.e. me) have a love affair with Pi; It is so symbolic of life and love. As an irrational and transcendental number, it will continue infinitely without repetition or pattern. And isn’t that how love circumscribes our lives? We can point to a beginning, but from there on out, it is a mystery that goes on and on, as long as we seek out the next computation of how love informs the diameters—the borders of our lives. Just as in love, the full value of pi can never be known. So often we try to approach love rationally, insisting that if we just take the decimal out far enough we can make sense of it all, find a rational reason to fall in love, understand the contours of a broken heart divided into integers of logic, use a tried and true proof or theorem to determine in advance the correct way to proceed in love, with a sure-fire, front-ended guarantee that if you just do this and this, this will be always be true. 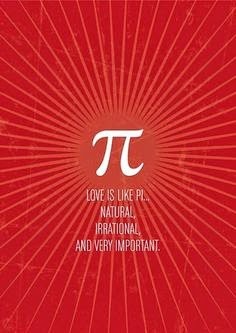 But that isn’t how the pi of love works.. It’s irrational, remember? And constantly changing, never repeating itself—not even once! not even after a trillion different variables have been added into the equation. There is no end to how long the pi of love will encircle us, where it will take us, if we only don’t give up on the equation, if we only try not to lose the thread of digits in the cluttered maze of our everyday lives, in the darkened corners of our unexamined hearts. It’s an equation that I have yet to master. I confess: most of the time, at this point in my life, I feel too faint-hearted to try. It’s terrifying to think of what might happen if I dared to think I could attempt to get past the celebratory date of pi and into the actual seeking it out and letting its transcendental mystery seek to measure the circumference of my heart. Every time I officiate at a wedding, I look with awe at the couple tying the knot-- young, old, first marriage, second or third, gay, straight, lesbian—and I think how do you know? What gives you the audacity to say “I do” and mean it forever, for infinity? It was a wonderful ceremony and I found myself, as I often do, verklempt at the irrational nature of love, the infinite amount of ways we can find love and meaning in our lives, the possibilities that await us if we can just keep our heart open to the pi of love and life. In a 1967 episode of Star Trek, Kirk asks Spock if there are any mathematical problems that just can’t be solved. “Compute to the last digit the value of pi,” Spock replies. Single or partnered, wherever we find ourselves on this historic pi day, may this be our life long adventure; the impossible task of finding the end of love, daily seeking ways to deepen and enrich our lives with all the many ways love shows up, through all of its irrationality, and may we meet the newness of each experience with gratitude for the mystery which resides in the circle of love. Of course, I ended the day with my own celebration: Apple pie--- that’s always a sure winner!